The NLEOMF is spreading some good cheer this holiday season in a couple programs to boost the spirit of giving in the DC area and around the country. On Tuesday, Dec. 2, we're working with DC's Metropolitan Police Department to kick off MPD's Holiday Toy Drive with a Tree Unveiling at the National Law Enforcement Officers Memorial Visitors Center on 400 7th Street NW, Washington DC. We'll have food, music, and fun for all our law enforcement supporters. It's a great chance to meet us, for us to meet you, for you to meet each other, and to get in gear for the holidays, as we'll start collecting toys at the Visitors Center for DC's kids in need. With the economy as it is, requests for assistance and gifts for children are coming in at high volume at MPD, and the NLEOMF wants to help. And, we want to celebrate the season with you! Why: To kick-off the Toy Drive and finally meet you in person! The holidays can be a difficult time for friends, families and supporters of law enforcement officers. 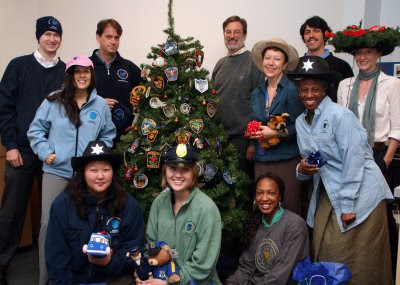 The NLEOMF wants to give people all over the country a chance to remember their loved ones this holiday season at the NLEOM Visitors Center. Call the Visitors Center during the month of December and tell us the officer you want to honor, and we'll post a special paper ornament with your name and his/her name in our Visitors Center for display. The officer you'd like to honor can be a fallen hero or a living legend. We request a minimum donation of $1, to go to the Memorial and Museum. We hope to cover the entire NLEOM Visitors Center in paper ornaments this year - a tribute to America's finest. It may not have been the largest session of the week, but what this afternoon’s workshop on the National Law Enforcement Museum may have lacked in raw number of attendees, it more than made up for in terms of the quality of attendee interest and discussion. Led by Laurie Baty, the NLEOMF’s Senior Director of Museum Programs, the workshop provided an update on the National Law Enforcement Museum and explored how law local enforcement agencies are an essential ingredient in preserving the history of law enforcement in America. Ms. Baty explained the history behind the Museum project, emphasizing its connection with the National Law Enforcement Officers Memorial. She described some of the 7,000 objects in the Museum’s growing collection and, more importantly, brought the objects to life by relating the stories behind many of them. For example, she explained how the artifacts of Macon County, AL, Sheriff Lucius Amerson, who in 1966 became the first black sheriff elected in the South following Reconstruction, will enable the Museum to more fully tell the story of the integration of the law enforcement profession and its role in the Civil Rights era. Sheriff Amersons’ son Anthony had heard about the Museum and wanted to get involved by donating his father’s items to an institution he could trust to maintain and preserve his father incredible collection of badges, weapons, uniform parts, photographs and other historical artifacts. Much of the workshop involved discussion with the attendees—from Nevada, Massachusetts, California, Illinois, Florida, Kentucky and elsewhere—on what historical objects exist in their agencies and how those items can best be preserved so that the history of local law enforcement in the U.S. can be captured and shared. Several participants described historical items they want to ensure are preserved, either at the National Museum or in their communities. At the NLEOMF’s exhibit booth, visitor traffic began to subside after a brisk first few days. Still, hundreds of lapel pins, remembrance bracelets, calendars and other information and goodies were given away on Tuesday. By 3:30 pm, as the lights were dimmed at the Convention Center, NLEOMF staff were packing up the exhibit booth and looking forward to next year's IACP Conference in Denver. The day started with the presentation of the 16th Annual Award for Quality in Law Enforcement. Several NLEOMF members were in attendance. Named for the IACP’s first president, the Webber Seavey Awards are presented each year by the IACP and Motorola in recognition of quality performance by police agencies around the globe. This year’s winners include programs from the Bundi District Police in Rajasthan, India, the Cincinnati Police Department and European Union Integrated Rule of Law Mission for Iraq, along with dozens of finalists and semi-finalists. In helping to present the awards, Director Carl Peed of the federal Office of Community Oriented Policing Services praised Motorola for supporting not only the Webber Seavey awards, but also the NLEOMF, the National Law Enforcement Museum and other projects. One the Museum project's largest donor, Motorola is funding the 9-1-1 Emergency Call Center in the Museum. Back at the exhibit booth, a new and popular item this year came courtesy of corporate partner 3M. The company provided us with neck lanyards made out of the same reflective Scotchlite material that meets new federal regulations for visibility gear that are going into effect later this year. Co-branded with the NLEOMF Drive Safely campaign, the lanyards inform agencies about a website where they can get information about the regulations and links to officer safety information. The day ended with “Host Chief’s Night,” a chance for the local police chief – in this case, William Landsdowne of the San Diego Police Department – to show his appreciation for everyone attending the conference. The event was held at Petco Park, home of the San Diego Padres, and attendees got to eat, drink and check out their baseball skills at a number of interactive “work stations” set up around the park. Preview for November 11: Laurie Baty, Senior Director for Museum Programs, leads a workshop on how to collect, catalog and store information and artifacts that may help the National Law Enforcement Museum or local communities preserve their history. 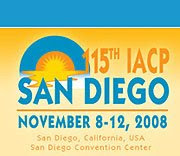 Activity at the International Association of Chiefs of Police conference in San Diego hit full stride today. A full day of workshops covered a wide array of law enforcement topics. IACP Committee and Section meetings got under way, and the NLEOMF presented at several of them. Probably the biggest activity for the day was the opening of the Exhibit Hall, at 10 am. The San Diego Convention Center is massive, with more than 750 exhibitors, featuring every law enforcement product and service you could ever think of. Several of the exhibitors are NLEOMF Corporate Partners, and our Chairman and CEO, Craig Floyd, joined members of the Development team in visiting these supporters and providing them with shields to display at their exhibits booths recognizing them as NLEOMF supporters. Some of our largest corporate partners – DuPont, Motorola and Advanced Interactive Systems – have the Memorial Fund and the National Law Enforcement Museum prominently displayed in their regular exhibit. At the NLEOMF exhibit (Booth #4523), a steady stream of friends, supporters and newcomers to the organization came by the booth. They picked up information about the Memorial Fund and Museum, plus a variety of give-aways—lapel pins, patches, 2009 calendars, remembrance bracelets and more. At 2 pm, Craig Floyd joined the leadership of “The Force,” a law enforcement uniform supplier and another NLEOMF Corporate Partner, for a special award. For the last four years, “The Force” has presented the Positive Force Award to a law enforcement officer who goes above and beyond the call of duty and displays exceptional courage, dedication or excellence. Nominations for the award come from a variety of sources, including the NLEOMF “Officer of the Month” awardees, who are automatically entered. This year’s Positive Force Award winner is Officer Brian Bobick of the Metropolitan Police Department of Washington, DC. Last December, Officer Bobick selflessly pushed his bike patrol partner out of the way as a speeding stolen vehicle, driven by a 15 year old who was intentionally trying to run the officers, came barreling toward them. 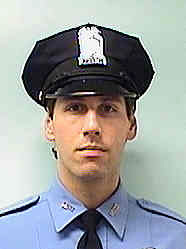 Officer Bobick was the March 2008 Officer of the Month of the NLEOMF. In the evening, the California Chiefs of Police Association hosted a reception in support of the Museum project at the Harbor House in Seaport Village. Several hundred friends and supporters heard impassioned—and sometimes humorous—remarks by Craig Floyd, Marine Gunnery Sgt. (and actor) R. Lee Ermey, and Pulitzer-Prize winning author Jospeph Waumbuagh. Wambaugh, a former Los Angeles Police officer and a member of the National Honorary Campaign Committee of the National Law Enforcement Museum, gave out signed copies of his newest novel Hollywood Station, which is set in the LAPD. Organized by Cynthia Brown, of American Police Beat magazine, the event was sponsored by several corporate friends, including LexisNexis, Glock, 5.11 Tactical, American Police Beat, and AIS.